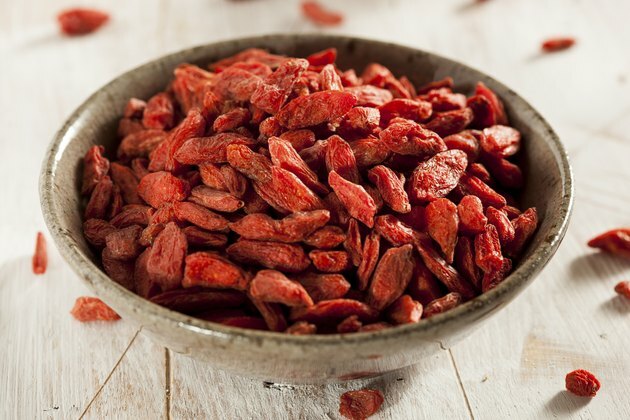 Goji berries, often used in traditional Chinese medicine, are small, red, edible fruit from a shrub native to China also known as Lycium barbarum. Goji berries are usually dried, eaten raw or cooked. They have recently been touted as a “superfood” for their exceptional health benefits. Goji berries are not proven safe in pregnancy. Do not eat goji berries while pregnant without your doctor's permission. Lycium bark or berries are used by alternative medical practitioners to treat a variety of conditions, including morning sickness in pregnancy. However, studies on the benefits of goji berries for any medical condition are lacking, according to MedlinePlus. Other possible benefits of goji berries include lowering blood pressure and decreasing blood glucose levels in diabetes. If you already have low blood pressure or low blood sugar levels, goji could worsen symptoms. Goji berries contain betaine that lowers homocysteine levels. High levels of homocysteine, an amino acid, may contribute to heart disease and stroke by increasing the risk of atherosclerosis and peripheral vascular disease. However, betaine is one of the ingredients that may be harmful in pregnancy since it may reduce kidney function and other body systems. Betaine may cause miscarriage, according to MedlinePlus. Known as an abortifacient, lycium may increase uterine contractions. In at least one case, goji berries increased bleeding in a woman taking warfarin, an anticoagulant. Pregnant women who take anticoagulants to prevent blood clots should only take goji berries under a physician’s supervision. Goji berry, like many herbal and alternative medicines, is readily available on the Internet. Some sites warn that goji berry should not be used in pregnancy while others do not. Since there are few actual clinical studies on goji berries or juice, the best practice when you’re pregnant is to avoid any substances that might present harmful effects. Health Castle; Is Goji Berry Worth the Hype? ; Sofia Layarda, R.D; March 2009.